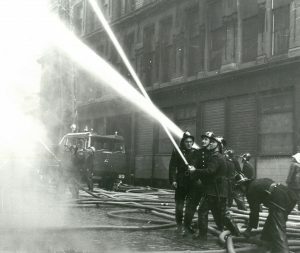 One of the biggest fires in Glasgow’s history took place 50 years today in a furniture and glass warehouse in James Watt Street claiming the lives of 22 workers, less than half a mile from where 19 Glasgow Fire Service firefighters and Glasgow Salvage Corp workers were killed eight years before in a bonded warehouse fire in Cheapside Street. While a memorial exists to those who died in Cheapside Street, and quite rightly so, no such tribute to the 22 dead and 21 families affected by the negligence of the owners of the A.J. & S Stern furniture factory a building that has also been used as a bonded warehouse prior to the fire. Julius Stern, one of the directors was found at the Fatal Accident Inquiry to have instructed that the fire escapes should be locked during working hours, a shocking decision, barely believable now and one we would hope today would lead to charges of culpable homicide against the individual and the company. Even to this day, our laws on corporate killing are unsatisfactory, not one charge laid in over 10 years since the ineffective corporate homicide legislation was introduced. What strikes Scottish Hazards is the different role Fatal Accident Inquiries played in investigation of tragedies such as this in the past, in a fatal accident inquiry heard in front of a jury whose members could clearly apportion blame. They found the 22 deaths were directly due to the fault and negligence of Samuel Stern and his brother Julius who had died in the fire. It would appear that it was easier to hold employers to account for recklessness and negligence than it is now. This is why we need a substantial review of our culpable homicide laws to ensure those responsible for workplace deaths can be prosecuted under our common law and we do not have to rely on corporate homicide legislation to deliver justice for families of workers killed at work, other wise they will have a long wait for justice, justice they may never get. Have a look at the proposals from Claire Baker MSP to reform of our culpable homicide laws and, if you can, respond to the consultation.